Launchpad couldn't import bug #195951 from Linux Kernel Bug Tracker. An update to linux kernel on Ubuntu 17.10 that enabled the Intel SPI drivers results in a serial flash that is read only in Intel Broadwell and Haswell machines with serial flashes with SPI_NOR_HAS_LOCK set. Fix: The issue was fixed in kernel version 4.13.0-21 by configuring the kernel so it is not compiled with Intel SPI support. But previous affected machines still suffered from a broken BIOS. 4. Make sure the kernel is installed without any error. Once installed, reboot. 5. At grub, choose the newly installed kernel. You can choose the "recovery" mode. 6. Reboot and go to BIOS settings to confirm your BIOS has been recovered. 7. In case your BIOS is not recovered, reboot to the new kernel, then reboot *once again* to the new kernel, do not enter BIOS settings before the reboot. After the second reboot, check BIOS. 8. If your BIOS issue remains, download another kernel from http://people.canonical.com/~ypwong/lp1734147/linux-image-4.15.0-041500rc6-generic_4.15.0-041500rc6.201712312330+clear+debug_amd64.deb, and use dpkg to install it, then repeat steps 4 to 6. After your BIOS is fixed, the kernel packages you just installed are no longer needed, you can remove it by running 'sudo dpkg -r linux-image-4.15.0-041500rc6-generic'. The patch used to build the linux v4.15 kernel in step 8 can be found at https://goo.gl/xUKJFR. 3) Reboot; you should now be able to load the new unsigned kernel that allows fixing firmware / SPI. The problem also affects Lenovo G40-30. I have just installed Ubuntu 17.10 in legacy mode (dual boot with Windows 10) and the boot from USB option is gone. Very serious issue, as there is no way to format our hard drives and reinstall an OS. There was no reference in the documentation for such a serious problem that would alter/corrupt our bios. I have the same problem with Lenovo U31-70. Since I upgraded to Ubuntu 17.10 i'm unable to save any changes made to the bios. I have the same problem - Lenovo Y50-70 - I took my laptop to a professional repair shop and they could not fix it. I dont know how we can get this repaired. I can also confirm this. I use the Lenovo Z50-70 laptop and I have encountered this problem. After installing Ubuntu 17.10 (and other remixes of it) and reinstalling it again, the UEFI BIOS does not save any changes except the date and time. I could not reset the UEFI BIOS settings because it did not save any changes and the CMOS battery is soldered, unfortunately. What is even worse, the UEFI BIOS does not boot any bootable media. I tried booting DVDs, USB sticks and other HDDs with no luck. The only thing that the boot menu shows is the old installation partition name and nothing else. Before that happened I used Manjaro distribution which did not have such problems even after reinstalling it multiple times. By the way, the solution to this problem was the a motherboard replacement... Two times. The only way to boot bootable devices is to install and properly configure rEFInd: https://forums.lenovo.com/t5/forums/v3_1/forumtopicpage/board-id/ll04_en/thread-id/154203/page/2. That does not solve the UEFI BIOS corruption problem. It is just a workaround. 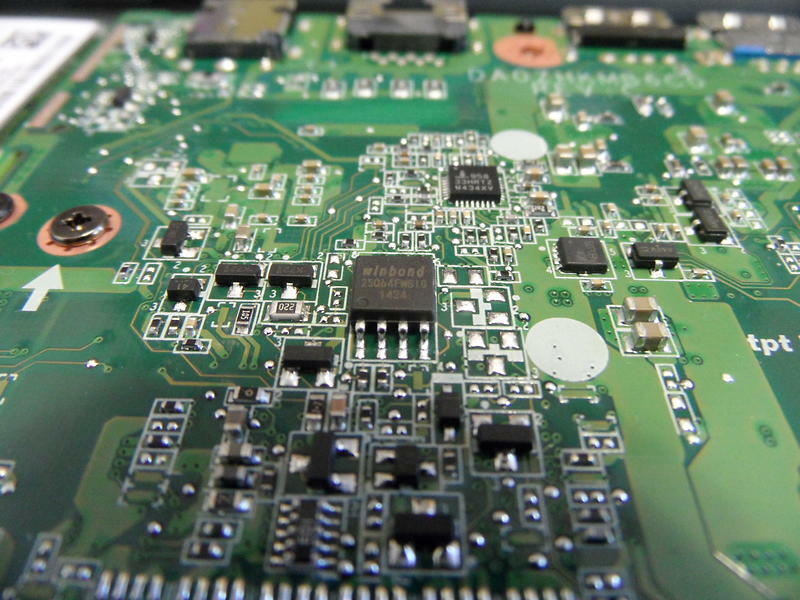 Maybe it is a defective Lenovo UEFI BIOS (two motherboard replacements proved that it could be defective "by design"). However, as I mentioned before, other distributions had not caused any of these problems before. This is not Ubuntu bug. I've created the workaround description (user marcin78 here) and as you can clearly see, it refers to my Antergos installation being the last one writing BIOS. I think (I'm not system expert) that this can be related to the way the kernel update scripts (modules rebuild or mkinird or any other) is handling the process. It could be that other system users don't do so many BIOS rewrites (Windows is updated in a different way) and this problem is not affecting most of PC users. Although there are reports also from Windows installations. So far the fix is replacing the chip. Far beyond most of our skills and definitely won't come cheap from Lenovo service. Hope the rEFInd tip can serve you for now. Actually, this MUST be a Ubuntu / Linux bug, as the current Ubuntu 17.10 rendered our Lenovo laptops useless in the long run, without any documentation or warning that the installation would affect the BIOS. This is a very serious issue, both legally and ethically and I think that we should demand an immediate fix. No OS should have anything to do with the modification of the BIOS without the consent of the owner. What will happen if we need to format our hard drives? How will we be able to install the OS that we want? i am not happy with any workaround. I want my computer to function as it did when I purchased it, in terms of its bios settings and booting from USB is an essential feature. What remains to be explained is the reason why it only affects Lenovo hardware and not any other brand. Just found a bios update, but it fails to install. I am trying to run the exe from Lenovo website on Windows 10. The laptop just restarts without performing the update. I am not sure devs are working/have been informed, we need to directly involve them since this is a MAJOR issue as perfectly explained by britgreek on post #9. Does anybody know how to speed up things here? I think Lenovo does not support Linux as an OS, therefore, they will claim that it is not their fault. On Lenovo forums, similar issues with similar BIOS symptoms have been reported since 2016, without any support. On the other hand, I do not see how Ubuntu devs can actually revert the current situation, as Ubuntu theoretically has no access to the BIOS or its code. In my case, these laptops are used in a private school, and now I am left stranded with machines that do not function as they should. Lenovo Yoga Thinkpad (20C0) is also affected. I agree with you, Lenovo has nothing to do with this issue, however I think it's Ubuntu devs responsability to take a look and try to fix this issue, since Ubuntu 17.10 has corrupted our bios. 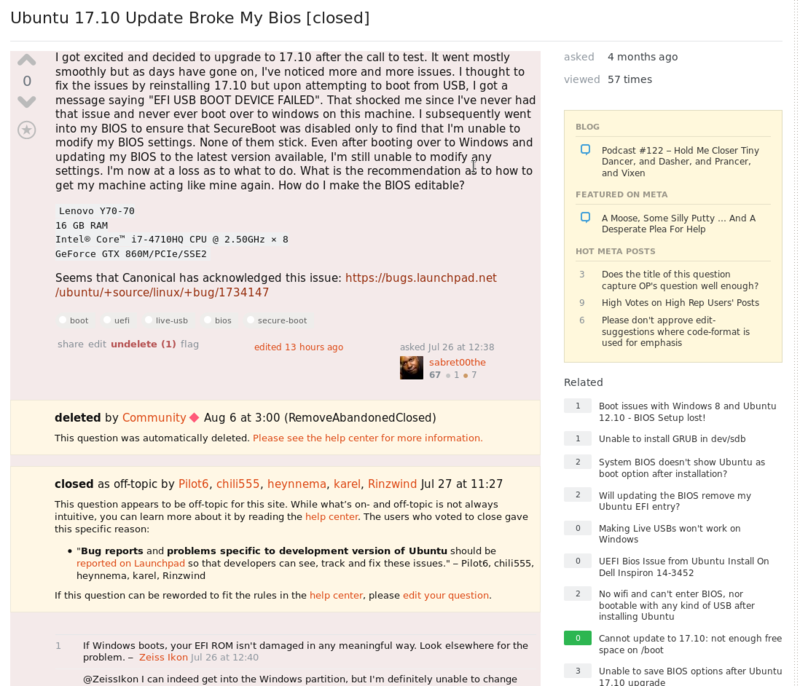 Our machines here (different models) reported this issue only after installing Ubuntu 17.10 and if you browse this forum, you would see that many others reported Ubuntu corrupting the BIOS, something that is extremely serious. Update: I contacted Lenovo Greece today, and they said they they had never heard of the problem, despite the posts in Lenovo's forums (some of which date back to 2016), and they suggested that in such cases, a change of motherboard may be the only solution to fix the issue. So, the situation is getting even worse. They also mentioned that Lenovo does not officially support Linux. this is also affecting my bios on the lenovo ideapad 100 15iby however usb booting is still possible. the troubleshooting steps i have taken are. This is unacceptable, right now my Lenovo G50-80 is a brick. USB Boot does not work. DVD Boot does not work. BIOS Boot menu doesn't autodetect changes on the hard drive EFI paths. And during an update grub stopped working, it reported a syscall error of I/O and on reboot I couldn't start the computer anymore. I would normally boot a live cd and boot-repair but guess what UEFI USB Boot does not work and Legacy capabilities won't work either. Just wanted to join in and say that I am also affected by this, the exact same way as everyone else. I updated to ubuntu 17.10 and my bios died. Like others, I also changed the CMOS battery etc. It was not a battery problem. I followed user Marcin Ciosek's work around that he posted on the lenovo forums and was able to fix my installation. But the bios is ofcourse still bricked. I've never experienced this before, I thought it not possible for an OS to brick a bios chip. If anyone knows how exactly this happened let us know. Probably I won't get a reply from them, but I am trying to get their attention. I also sent an email to Canonical LTD (legal department) explaining the issue and threatening to take legal action on them. As per my previous post, I am trying to get their attention. I'll keep you informed. Are the machines dual installed with Windows 10? Has there been a recent upgrade to Fall Creators Update? Note that many Lenovo machines fail to boot or boot to black screen after such an update. Such an upgrade affects subsequent boots to both win10 and ubuntu. Can you get into one-key recovery mode? Can you get to the boot options menu? Can you get to the bios settings menu? 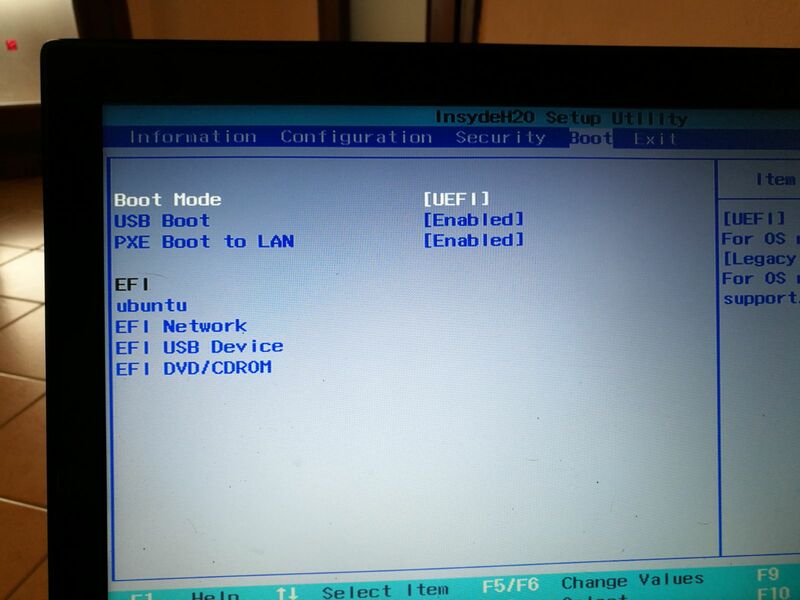 Can you configure boot entries in the bios settings to boot from the /EFI/BOOTX64.EFI? SHIM? UBUNTU/GRUB2.EFI? Have you applied all the Lenovo bios/firmware upgrades? To this point, I am not yet convinced that there is a bug in Ubuntu that causes this. For one thing, the issue is far too confused here on this report for me to make sense of what is going on. The included links to Lenovo forums do not appear to me as bugs in Ubuntu. What settings are changed in the BIOS and appear to not be saved? Can your system boot into Ubuntu? If not, what last appears on screen? If yes, then what does 'sudo efibootmgr -v' report? Failing to change things in the BIOS does not sound to me like anything that Ubuntu could have caused; but it also seems like there might be confusion as to how booting works on these systems. When systems are booting in UEFI mode, you can't simply add files here and there on the system and expect things to work -- this is why you have named entries in the firmware (the "BIOS") such as "ubuntu": there is some configuration involved, which can be done using 'efibootmgr' on Linux. If you can't change time/date in firmware, or any other option that is not boot related, you need to consult Lenovo. There is nothing I can do about those. If you are having issues changing boot entries in firmware, it's possible that it is simply not supported -- the firmware might not allow you to set the ordering; and to disable UEFI you may need to first disable Secure Boot. The best is again to consult Lenovo for help and describe exactly what you want to do. They know how their firmware is supposed to work; and what is and is not possible to do. Please also try using F12 or Fn-F12 (whatever the key combination is on that particular hardware. I have Lenovo hardware here, but none of the affected systems) to get to the Boot Selection Menu and see if then you can boot to USB or to Windows (if it's still installed) from that menu. Please avoid using rEFInd if possible, as I cannot provide support for its use. It is known to change settings incorrectly; and that can cause issues on upgrade. The fewer extra changes on a system once it stops working is always better to figure out what is wrong. I dont have a dual boot system, i just have ubuntu 17.10 and since the upgrade (17.04 to 17.10) im unable to save changes made to the bios such as boot order, secure boot, intel virtualization, etc. My machine is a Lenovo U31-70. Hi, thank you for having a look. I can change all BIOS settings, but the issue is that when rebooting, the BIOS keeps the old settings so the machine keeps rebooting in safe-mode. Thus usb is not recognized. before installing Ubuntu 17.10, USB was present as third option under the sub-section Legacy. I hope this make things clearer. Ubuntu 17.10 is working properly for me, and within Ubuntu USB ports work properly. the message is: EFI variables are not supported on this system. My Lenovo G50-80 was running a Ubuntu 17.10 with no dualboot. The BIOS didn't allow me to change ANY of the options and USB/DVD boot did not work for a few weeks or maybe months (I don't check BIOS every day). Also it seems that grub failed when doing an apt upgrade (gave me a syscall error I/O) and the laptop turned itself into a brick because the "ubuntu"EFI entry also stopped working. Right now I've set up a PXE server and I'm trying to install Windows 10 over LAN. If I can get it to boot, I'll try to apply the latest BIOS patch (only available for install through Windows) and see if everything goes back to normal. Status update: Attempt to install Windows over PXE won't work. The BIOS is really derped. The error of Windows Installer is: "Windows could not update the computer's boot configuration. Installation cannot proceed.". Bruno's efibootmgr output from comment #29 shows the same damaged boot entry syntax that has previously been seen on Acer laptops. To my knowledge this is not compliant with the EFI spec. Did Lenovo recently switch firmware vendors on this product line? @tobia; contact Lenovo support. If USB does not show up, it's not an Ubuntu issue. Your USB system may be failing, or the USB key is not recognized (which would make it not show up as a boot option). You might want to try with a different USB key. Was 'ubuntu' listed before under UEFI? You should also not change the boot settings unless you know what you are doing, as doing so can obviously keep your system from booting correctly. If things are being reset at boot (presumably after a few seconds of delay at a blank screen), then you might be dealing with a bad firmware; you should contact Lenovo for help to upgrade or revert the last firmware update. @Alexis Rico (sferadev); I suspect your hard drive is failing, or you are dealing with a bad firmware. GRUB would not cause this. What options are you trying to change in BIOS? What happens exactly when you try it? Is there an error, does it allow you to save, but then you get a blank screen for a while, and the system "reboots" again? @bruno; as above: what happens? What settings do you try to change? What happens exactly when you do? What precise steps do you take? In general, if you are unable to save setting changes in BIOS, you *need* to contact Lenovo support, especially if at "reboot" you see a blank screen for a while before anything happens. This may mean the firmware is confused, and its safety mechanisms will attempt to recover by settings back to their defaults. My problem is very much like @tobia described, I make some changes in the bios (like disabling secure boot or enabling legacy mode) press Save and exit then the computer reboots and bios settings go back to default. I guess that the reason why @tobia doesn't see the USB drive listed in the boot options is because he cant disable secure boot. And I dont see any blank screen, the boot process seems pretty normal. Im sorry i dont really know what lenovo is doing. As far as I know I didnt do any bios upgrades. 1) BIOS Doesn't work fine. Same problem as @bruno USB Boot doesn't work, DVD boot doesn't work and saving bios settings are lost of exit and save. No white screen just the changes don't persist across reboots. 2) The hard drive failed leaving system non-bootable. Today I've also tried installing the OS on a new drive and a different computer, booting through PXE to a Ubuntu Live CD and trying to insert a new entry for the new os through efibootmgr. So far I've learnt that efibootmgr is unable to create a new entry as it errors No such File. And deleting the old EFI entries seems to work but when rebooting to bios the old EFI entries are still there. > save. No white screen just the changes don't persist across reboots. > 2) The hard drive failed leaving system non-bootable. > new entry for the new os through efibootmgr. > when rebooting to bios the old EFI entries are still there. is very difficult to discern what it is. firmware's available nvram space and as a result causing boot problems. Yes, it is a BIOS bug. My comment #581 is not a reply for your posting but the one above :). I just wanted to point out that it is possible to install a new version of Ubuntu from the internal disc to another partition of the sam disc then boot from that newly installed Ubuntu partition to fix the BIOS problem. To do that, you need GRUB2 instead of EasyBCD. But if your laptop is still under the watrranty, certainly RMA it is the another solution. >>My point was that I have difficulty in changing the order, changes are not permanent, and if it does boot from the CD it does not work in UEFI mode, and so I cannot use e.g. Boot Repair. >>Would it be harmful to use fix referred to above, or is that specific to Lenovo? To make this boot order change permanent, you have to repair the EFI. If you can access to the any sort of OS on the internal disc, you can install a newer version of Ubuntu to the another partition. This dualboot creation is universal, not just for a specific laptop model. If you have any inportant data on your working OS, I suggest you to make a backup before re-partitiong the disc. I have applied the fix (alternate kernel) and that did fix the problem. However the alternate kernel is not without issues. I am unable to install 'zfsutils-linux' because the zfs modules cannot be built. There is more information at https://askubuntu.com/questions/1012083/cant-add-zfs-to-17-10 and I can copy any relevant information here if appropriate. windows user on a g50-70 Lenovo here that can't use ubuntu solution becouse of a live version on a pen drive which was erased, any suggestions? And what if I can't boot into Ubuntu? I have installed Ubuntu 17.10 on my laptop lenovo G50-70 which corrupted the BIOS and unable to save any BIOS settings using all modes as I have tested. Also I have installed latest version Ubuntu 17.10.1 which was not fixed the BIOS issue it is continuously displaying "EFI USB Device boot failed" on every reboot also now I have completely refreshed my Laptop with Windows 10 then also I'm unable to save my BIOS settings which is corrupted. Please share me the action plan how to sort this ? I did not try it myself, but in case of everything eles failed, this site might give you some idea. i had a problem where i needed to update my bios, but this bug kept me from being able to make any bios changes until i installed the older kernel. obviously a bug with the kernel that came with 17.10. I have a Lenovo G50-80 and the same Problem with the Bios. It was Ubuntu 17.10 and Win 10 installed. After I erased the Harddisk kompletly, I only can now boot the Ubuntu 17.10 LiveCD. The 17.10.1 I was tried but no booting. The Fix from here i was tried, but it wasnt funktion. So what can i do now? Any suggestions? Would I be relevant if asking you for three advices from my novice standpoint, please ? First, since you published a list of « affected machines » in the Bug Description, I would like to know if this list is closed or expansible; if other machines could have their BIOS corrupted by launching the Kernel comprised in 17.10. Secondly, if the list of Affected Machines is expansible, if you could elaborate on the criteria by which to discern if a machine will be affected, please ? And for my own interest, if the Lenovo X200 should be included in the above list, or if any of the concern expressed in the Bug Description shall be given to the X200? Thanks for your attention, much kindly. I would also call upon you to know if the «installation» of LibreBoot that rewrites an open-sourced BIOS can be an alternative way to the fix described in the Bug Description; that is, to correct the corrupted function found the (proprietary) original BIOS ? If so, could you say in which condition, or express reserves ? Thanks again for your attention, much kindly. Would that be possibile to have a live ISO with the 2 kernels of point 2 and 8 ready to try? I have a windows 10 only box at the moment, but luckily I can boot usb, so I coould try fix my bios and UEFI (as of now I cannot install anything on my HD). I was able to fix this issue in my laptop (HP Pavilion N204TX) using the patch provided (linux-image-4.15.0-041500rc6-generic_4.15.0-041500rc6.201712312330+20170103+1_amd64.deb). The issue appeared in my laptop once I upgraded to Ubuntu 18.04.
go several months with the BIOS problem I have a Lenovo Y50-70 try to reinstall some version of Linux via USB without any success. my last hope was to try to install Linux from a network since the BIOS allows to start from an OS network but apparently this option is also not possible, I was told that having the recovery of OS windows I can start from the bios with the system recovery. @Danny Vilca the repair method described in the bug description should fix it. If not then ask for help on the Ubuntu Users mailing list. Also affected: Dell XPS 13 9345 Developer Edition. The fix works for me, but what are inexperienced users going to do? I believe the bug should not be affecting more people as it is not present in current kernels. Also 17.10 goes end of life in a few weeks. - but it was not funktion... what make i wrong? Thanks, solved my problem in bios uefi Lenovo G50-80. 17.10 w/o .1 is *toxic* (and anyway EoS, with .1 also). Already the first boot up changes the value. The UEFI is destroyed, so to speak. Btw., that would not have happened in CSM mode instead UEFI mode. Hard cheese, inform in advance. Installing a clean kernel in a live system has no effect because it doesn't allow you to boot. 1. Remove the HDD and connect temporary exclusive at another System! 2. Install Ubuntu 18.04.1 64 bit in UEFI mode! 3. Insert this HDD in the Lenovo G50-80 and try to boot! This should correct the false value. 3. Copy the flashing tool with the current UEFI version to the harddisk (https://pcsupport.lenovo.com/de/en/products/LAPTOPS-AND-NETBOOKS/LENOVO-G-SERIES-LAPTOPS/G50-80/downloads/DS102231 - sadly old A0)! 3. Insert this HDD in the Lenovo G50-80 and try to boot! 4. Flash the current UEFI! 5. With a little bit luck the UEFI values will be set to defaults. 6. Now you could kill Windows with an Ubuntu 18.04.1 64 bit installation. One more comment: Asking at https://forum.ubuntuusers.de/topic/corrupted-bios-due-to-intel-spi-bug-in-kernel-/ isn't the best idea. And finally: Nail the 17.10-DVD to the wall! I mean Win 1803 of course, "1804" doesn't exist. Hi, I have a PEAQ PNB S1015 i2N3, and I have issues starting since my initial 16.04 ubuntu installation. I have completely deleted ubuntu, deleted the efi partition of ubuntu, reinstalled windows from disk. I cannot boot from usb anymore. Every start my computer blinks a warning message with "ubuntu boot failed". And my bios still thinks ubuntu efi files are present. I cannot change certain settings in windows, and cannot use restore windows. Official method didn’t work for me either. Try my solution in the comments. Look back to December or January. > initial 16.04 ubuntu installation. > reinstalled windows from disk. > I cannot boot from usb anymore. > Every start my computer blinks a warning message with "ubuntu boot failed". > And my bios still thinks ubuntu efi files are present. > and Haswell machines with serial flashes with SPI_NOR_HAS_LOCK set. > * EFI entries read-only. > affected machines still suffered from a broken BIOS. > the reboot. After the second reboot, check BIOS. > and use dpkg to install it, then repeat steps 4 to 6.
what if I can't boot from Ubuntu again and what if I reprogrammed my bios. - via USB boot if you can boot Linux and use in terminal "efibootmgr -v"
3) Backup partition "sfdisk -d /dev/sda > x.txt"
5) Replace Partition with new UUID "sfdisk -f /dev/sda < x.txt"
Lenovo yoga thinkpad. Cant boot into ubuntu or win10. After boot screen I get error 0271 For Time/Date. After entering bios I cannot make any changes. Cycle continues. > in which condition, or express reserves ? > Thanks again for your attention, much kindly. > Test Case: Fix has been verified by our HWE team on affected hardware. Hi everyone, i cannot have access on ubuntu and USB boot not work. Is there any way to fix the problem? Hi. I'm experiencing problems that look very similar to the ones described in this bug report (can't boot from USB, changes made in UEFI won't save). This I noticed a couple days ago when trying to install a new distro, that failed with "Installing for x86_64-efi platform. Could not delete variable: interrupted system call. Grub-install:error:efibootmgr failed to register the boot entry: block device required"
I had Ubuntu 17.10 installed last year. To make a long story short, I tried boot-repair and it failed, I tried installing other distros and got the same message. I tried upgrading the UEFI and it failed. It seems I can't even get a grub menu or prompt at startup. My computer boots to the message "no boot device on HDD". I can still boot however, if I pres F9 and manually choose "boot from EFI file" and select the proper .efi file (I can boot into Lubuntu 18.10). I initially asked about the problem at https://askubuntu.com/questions/1104515. 1. how can I know for sure if this bug is the source of my problems ? 2. I followed the repair method described in the bug description. I can install kernel 4.15 without problems. But with no grub prompt at startup, how can I make sure to boot the right kernel that will fix my issues ? Hi, I have this exact issue, and I got to step 5, but secure boot is preventing me from booting the new kernel, because it is unsigned. Is there a signed version of it, or can I force it to boot from it somehow? Thank you. Thanks for the help Mathieu, however, it sadly did not solve the issue. There was no /efi direcory in my /boot. I still tried to create the directories you told me to copy it into, but that didn't work. Is it possible I have a non-UEFI version of ubuntu? Marek, Secure Boot is a UEFI feature. It is not possible for you to have Secure Boot blocking a kernel boot if you do not have UEFI. It is possible that your EFI System Partition is not mounted at /boot/efi, if you have modified your /etc/fstab since installation. For the system to boot at all under UEFI, you must have an EFI System Partition. For you to have a grub that refuses to boot unsigned kernels, you must have updated the contents on that EFI System Partition rather recently. The output of 'efibootmgr -v' may help you locate the partition so that you can mount it. The output of 'efibootmgr -v' showed me where the EFI partition is, but I have no idea where it's mounted or how to get to it. After that, I get into a normal grub, that's probably located somewhere on the flash drive. The ubuntu on the flash drive was installed on another computer, and just brought over to the laptop. > I have no idea where it's mounted or how to get to it. to mount it (or /dev/sdb2, depending). Sorry this is such a mess. Displaying first 40 and last 40 comments. View all 623 comments or add a comment.